So the other day, the Big Red Car says that there is a good bit of learning for a CEO in reading military history and especially espoused reading about the Battle of the Bulge — Hitler’s last gasp which was the last huge battle of World War II and which allowed the Allies to destroy much of the German will to resist and the troops with which to fight. Thereafter the Allies drove into the Ruhr and Germany, in general. The War was over within six months. What to read and why? 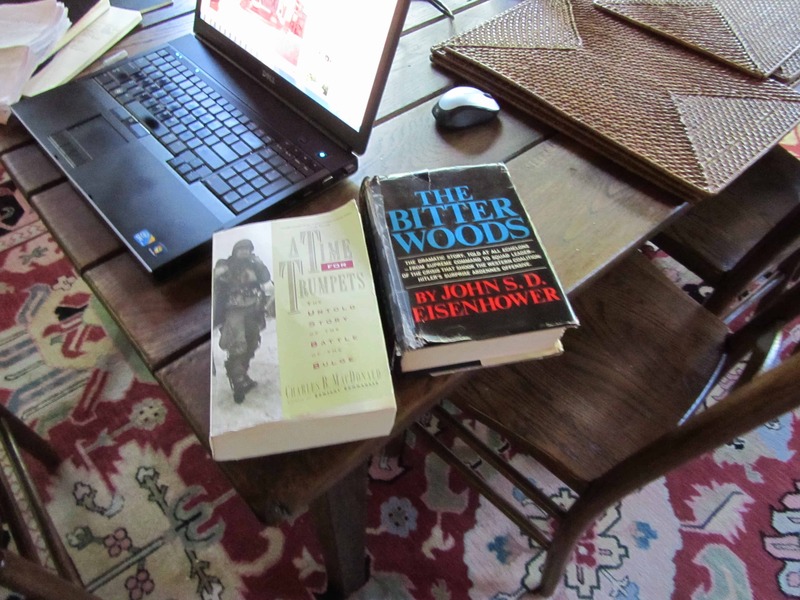 A couple of good books to read are A Time for Trumpets by Charles MacDonald (1985 time period) and The Bitter Woods by John SD Eisenhowser — Ike’s son (1969 time period). If you have read a bit of military history, you will recognize MacDonald as the author of Company Commander, the definitive work of a company grade Infantry officer in World War II. It is a must read to understand the War at the bayonet level. Any officer who has not read this book should be cashiered. MacDonald fought in the Battle of the Bulge. MacDonald was there and his is the bottom up view of things. John Eisenhower had access to every American commander — his Dad was, of course, running the whole damn show — and every German commander after the War. The Bitter Woods is the top down view. These are not easy reads with each book running to 500 – 700 pages. What will one learn, Big Red Car? The Big Red Car engaged in a very lively exchange with a bright correspondent and reader who rejected the notion that the military style of leadership was particularly useful or applicable to the startup or small business world. The Big Red Car agrees with that — the reading of military history is NOT intended to espouse a style of leadership but rather to impart lessons in planning, crisis leadership, entrepreneurial panic, organization, competitive analysis and other useful disciplines. Do not go out and buy epaulets for your folks but do take a careful look as to how the military has dealt with planning, as an example. The military has an organizational bias toward both detailed plans and “on the fly” plans which provides an excellent framework for a company founder or CEO to evaluate the effectiveness of their own planning. This is just one example. The Battle of the Bulge has at its roots an intelligence failure — perhaps analogous to a market research failure — to assess German capabilities in that the Allies who had been destroying the German Army west of the Siegfried Line, the Rhine River and the German border were understandably confident and given to exploiting the advantage. They were destroying German units through fire and maneuver, fire support (air and artillery) and sheer weight of numbers locally. The American and British Generals were by now salty, seasoned and competent. The Battle of the Bulge was primarily an American fight with the British playing a very small role. The Big Red Car will never use Hitler as an example of anything good as he was such a pathetically evil person and the embodiment of evil on Earth. Nonetheless, the Germans were able to cobble together an enormous military force replete with men, tanks, tank destroyers, artillery and bridging equipment. The achieved complete tactical surprise — which is odd since they had attacked through the Ardennes in the attack on France at the beginning of the War, led by a Panzer division commander named Erwin Rommel — in location, timing and magnitude of force. Reading this account, a startup or small business founder and CEO will see parallels in marshaling forces for a new product introduction or pivot. It is all there for you to read and assess. The Americans were on the verge of driving into Germany and had cracked the Siegfried Line but not yet the Rhine. The Allies had made the decision to maintain the offensive through the winter to prevent the Germans from having time to refit and reorganize their armies. This turned out to be a brilliant decision and shortened the War a bit. The Americans had deployed forces in the Ardennes — Belgium, not France — with an eye toward the German deployments on the other side and therefore had so sparsely defended what became the center of the German attack that they had created their own vulnerability. When it became apparent what was really happening — an attempt to reach the Meuse and ultimately Antwerp — the Americans reacted with a skillful withdrawal, a quick return to the offensive and some damn good tactical fighting. The “story” of the Bulge hears the echo of Patton’s quick turning of the Third Army north but it also is replete with the historic stand at Bastogne by the 101st Airborne who held this cross roads forever under the weight of enormous German pressure. This battle ranks with Valley Forge and Trenton and Normandy as historic feats of American arms. In reading these books, read slowly with care and perspective. Be prepared to read and think and inject yourself into the role of many of these commanders fighting in incredible weather conditions, under long odds and with imperfect information — hey, that sounds exactly like being an entrepreneurial CEO. See how small decisions and following one’s instincts and simply fighting hard shape the outcomes. This entry was posted in Business, Crisis management, Decisionmaking, Entrepreneurship, Inspiration, Military and tagged battle of the bulge, military history. Bookmark the permalink. Nice job, BRC. Crisis management under fire teaches many lessons.